Sun 25th Nov 2018 Launch date for The Tunes Foundry 2 and the Tunebook of Newly Composed Tunes. 6:30pm – 7:30/8pm at The Sanctuary at Cruises, Ennis – all welcome to attend and partake. Fri 7th Sept 2018 Open session at the Auburn Lodge with Jimmy Clancy from 9:30pm in the Bar. Visiting musicians and locals can connect and play together – the more the merrier!! Áine on flute, Jimmy Clancy on accordion. Wed July 12th 2017 ‘Áine’s New Tunes’ Summer Concert Series’ continues at Bergins, Main St. in Portlaoise from 8pm! ‘Áine will perform, on tinwhistle and flute, a selection of her recent compositions. Presenting also, some popular tunes from her well-received album: ‘The Tunes Foundry’ (released 2014). She will be accompanied by her husband Matt, on guitar, bodhrán and some songs. She will interact with the audience – encouraging musicians to ask questions and any who know her tunes to play with her towards the end of the performance. At this Portlaoise peformance she will be joined by Orla Coughlan on fiddle, local primary school teacher/comhaltas fiddle teacher originally from Co Clare and fellow member of the group Siarlinn who perform once again at Fleadh Cheoil na hÉireann (Aug 2017). Sunday 2nd July 2017 ‘Áine’s New Tunes’ Summer Concert Series’ continues at ‘The Maguire Suite’ Old Ground Hotel in Ennis from 6-8pm! ‘Áine will perform, on tinwhistle and flute, a selection of her recent compositions. From this extensive repertoire of tunes, each concert will feature a unique programme. Presenting also, some popular tunes from her well-received album: ‘The Tunes Foundry’ (released 2014). She will be accompanied by her husband Matt, on guitar, bodhrán and some songs. Áine will interact with audiences – encouraging musicians to ask questions and any who know her tunes to play with them towards the end of the performance. She may have guests join her at some concerts – more information will be shared on the homepage or Áine’s Facebook Page (Aine Heslin Music) as it comes available. Friday 30th June Open seisiún in Foley’s Bar, Cross. First night of a three-day festival. With Mairéad Considine, Karen Walsh, Matt and Áine Heslin. more info soon. Sunday 25th June 2017 ‘Áine’s New Tunes’ Summer Concert Series’ begins at ‘The Sanctuary’ at Cruises Bar in Ennis from 6-8pm! ‘Áine will perform, on tinwhistle and flute, a selection of her recent compositions. From this extensive repertoire of tunes, each concert will feature a unique programme. Presenting also, some popular tunes from her well-received album: ‘The Tunes Foundry’ (released 2014). She will be accompanied by her husband Matt, on guitar, bodhrán and some songs. Áine will interact with audiences – encouraging musicians to ask questions and any who know one of her tunes to play with her towards the end of the performance. She may have guests join her at some concerts – more information will be shared on the homepage or Áine’s Facebook Page (Aine Heslin Music) as it comes available. Easter Saturday April 15th. Joining Mairéad Considine, concertina and Matt Heslin, guitar/vocals at 10:30pm in Madigan’s of Doonbeg, Co. Clare. Open seisiún. Sat 11th Feb @7:30pm Performing the piece ‘Bláthú’ after the screening of the film ‘Connected 2 Each Other’ in Cultúrlann Sweeney, Kilkee – also playing;accordion player Latitia Browne and singer/harpist Aisling Moroney (two fine young musicians from West Clare) who also featured on the soundtrack.Exciting night in Kilkee Sat Feb 11th! Friday June 3rd 2016 – seisiún in Fitzpatrick’s Bar, Kilkee with Matt, Áine Heslin and Colin Sheehan. May 5th, 12th, 19th and 26th in Cruises Bar, Ennis. Friday 29th April 2016 – Open seisiun at Keane’s Bar, Carrigaholt. http://loopheadclare.com/keanes-bar-grocery-carrigaholt/ From 9pm along with Breda Laetham (bodhrán/vocals) and Colin Sheehan (concertina). Cruises Bar Ennis – Open seisiún with Áine Heslin tin-whistle and flute, Jimmy Clancy button accordion. Starting 8:30pm and all are welcome to join or listen and celebrate the special evening together. Áine will have some cds for sale and will play some new material too. Jan 2nd 2016 (Sat) early reception trad gig at a wedding in Co. Clare. Friday Feb 27th 2015 – Launch of ‘The Tunes Foundry’ CD (Áine and Matt) at O’Connor’s Pub, Doolin 7pm. Saturday March 14th 2015 – Áine, Matt and Mairéad Considine at Madigan’s Pub, Doonbeg 10pm. 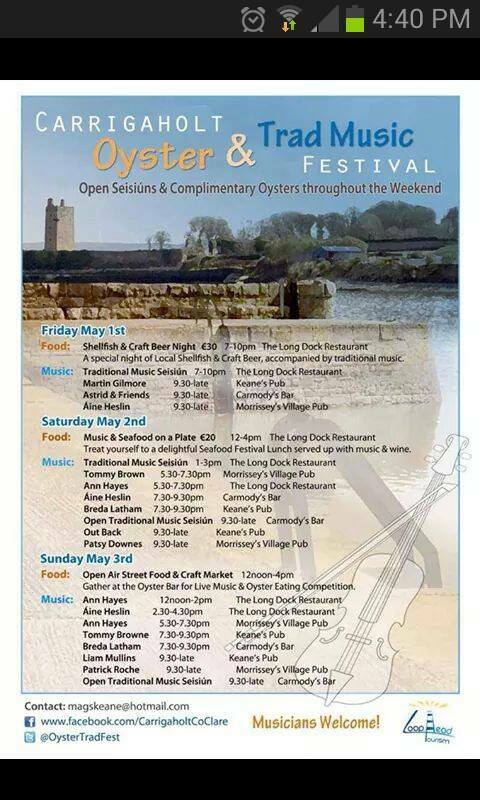 Gigs on Friday night 9:30pm at Morrissey’s Village Pub, Sat eve 7:30pm – 9:30pm at Carmody’s Bar and Sun afternoon 2:30pm – 4:30pm at The Long Dock Restaurant. Saturday June 13th 2015 – Private gig 5pm till 10pm. Áine and Matt Heslin with Siobhán O’Halloran. Saturday June 20th 2015 – Private gig 5pm till 10pm. Áine and Matt Heslin with Siobhán O’Halloran. Saturday June 27th 2015 – Private gig 5pm till 10pm. Áine and Matt Heslin with Siobhán O’Halloran. Saturday July 4th 2015 – Private gig 5pm till 10pm. Áine and Matt Heslin with Siobhán O’Halloran. Saturday July 11th 2015 – Private gig 5pm till 10pm. Áine and Matt Heslin with Siobhán O’Halloran. Saturday July 18th 2015 – Private gig 5pm till 10pm. Áine and Matt Heslin with Siobhán O’Halloran. Saturday July 25th 2015 – Private gig 5pm till 10pm. Áine and Matt Heslin with Siobhán O’Halloran. Saturday Aug 1st 2015 – Private gig 5pm till 10pm. Áine and Matt Heslin with Siobhán O’Halloran. Saturday Aug 8th 2015 – Private gig 5pm till 10pm. Áine and Matt Heslin with Siobhán O’Halloran. Saturday Aug 15th 2015 – Private gig 5pm till 10pm. Áine and Matt Heslin with Siobhán O’Halloran. Sunday August 23rd 2015 – Playing at The Battery, Labasheeda at 11am as part of https://www.facebook.com/pages/Dan-Furey-Weekend-Labasheeda/164517380280892?fref=ts Also playing at 6pm for the Open Sessiún at the Labasheeda Community Centre – musicians welcome. Sunday 18th October 2015 – Open seisiún with Niamh Casey and friends at Myles’ Creek, Kilkee from 8:30pm. Sunday 25th October 2015 – Open seisiún with Matt and our good friends at Myles’ Creek, Kilkee from 8:30pm. All welcome. Sunday 8th November 2015 – Open seisiún with Niamh Casey and friends at Myles’ Creek, Kilkee from 8:30pm. Thurs 10th December 2015 – Live performance (Áine on tinwhistle/flute and Matt on guitar/vocals) in the Irish Cultural Centre Hammersmith after the screening of the new film ‘Connected 2 Each Other’ at 8pm. Sunday 20th December 2015 – Open seisiún with Niamh Casey and friends at Myles’ Creek, Kilkee from 8:30pm. If you would like to book Áine for an event, please contact her at aineheslinmusic@gmail.com for available dates. See also Contact page.